James Stewart was awarded the 2016-2017 Jimmy and Dee Haslam Dissertation Fellowship to support the completion of his PhD in English. 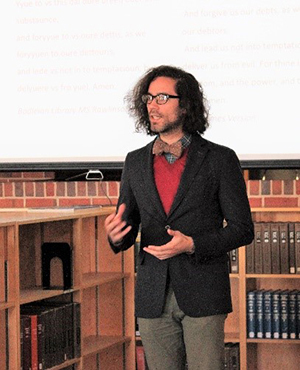 His dissertation, titled “Lords of Retinue: Middle English Romance and Noblemen in Need,” explores the discourses of chivalric heroism and noble status in medieval Britain. This inquiry focuses on heroes’ companions and supporters—characters who have traditionally been sidelined in literary analyses of medieval romances—in order to highlight their role in facilitating feats of chivalric heroism. Drawing on recent historical studies of the English nobility from the reign of Edward I (1272-1307) through the reign of Richard II (1377-1399), Stewart argues that efforts to centralize royal power and administration in 14th century England coincide with a growing willingness among Middle English poets to combine ideals of prowess with ideals of lordship and cooperation in narratives of chivalric excellence. Mindful of the social processes that support noblemen’s status, romance poets in late medieval England specify that heroic exploits depend in part upon a hero’s ability to draw on the loyal support of his retainers. By concluding with a look at some recent analyses of nobility and masculinity in medieval literature, Stewart offers that the study of romances can still make considerable contributions to our understanding of knighthood, noble status, and masculine identity. The generous support of the Marco Institute has also allowed Stewart to attend the Saint Louis Conference on Manuscript Studies, where he presented a project on manuscripts of Vegetius’ De re militari (c.383-450) and medieval reading practices. He also gave a paper on the sacrament of penance in the Middle English Breton lay Sir Gowther at the 2016 meeting of the Southeastern Medieval Association in Knoxville.